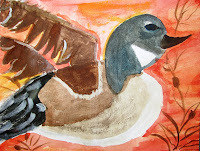 Prep: I researched books, Internet sites and calendars for a variety of duck photographs and had the students pick their favorite. 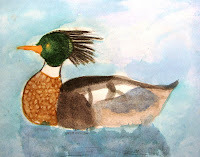 Each student received a 9 x 12 watercolor paper, sketching paper, soft leaded pencil, and erasure. Steps: I demonstrated two drawing techniques. Contour and Shapes. (Most students preferred the shape method). 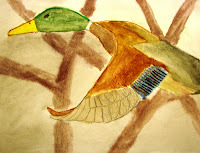 Then the students did a warm-up; working out the basic shapes of the ducks and position on the paper, then re-drew their ducks onto watercolor paper. For this age group (11 years) the most challenging part is to keep the pencil lines light enough to erase later. A Light box might be a better way but in a class of thirty kids, such a task would be hard to accomplish in 50 minutes. 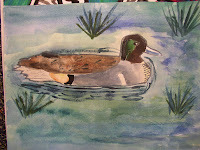 After sketching the duck, the next two classes were spent painting with watercolor paints. 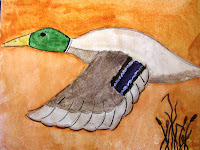 I focused on teaching the kids how to layer watercolor paints in order to add details such as spots or tiny feathers (wet brush on dry paint). 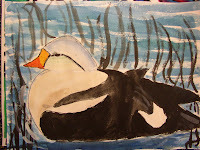 This is a difficult concept as lots of kids still insist on painting the feathers first then painting around the details. 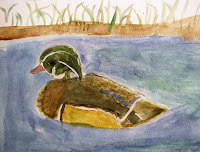 Next, I demonstrated wet-on-wet technique for the backgrounds. Small details were added later with colored pencils.